The life-or-death game has evolved. Thankfully this means Pop! 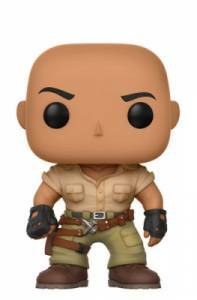 Movies has too with the Funko Pop Jumanji Welcome to the Jungle release. Jumanji: Welcome to the Jungle is set 20 years after the events that took place in the 1995 original. This time around, the cast is trapped inside a video game rather than a board game. 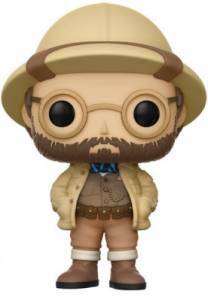 Funko Pop Jumanji features archaeologist Dr. Smolder Bravestone, a.k.a. Dwayne "The Rock" Johnson, which is quite obvious just by his distinct eyebrows. The figure for Dr. Bravestone appears to be more military than artifact hunter as he wears black gloves, green pants and a tan button-down shirt with sleeves either rolled or bunched up due to the size of his muscles. 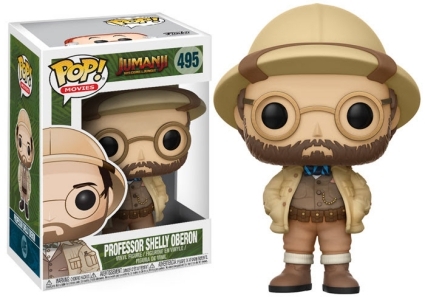 Order Funko Jumanji Figures on Entertainment Earth. Professor Shelly Oberon, portrayed by Jack Black, is also included in the lineup. Bravestone's more academic counterpart displays a thin beard and round glasses. His entire outfit is composed of various shades of brown or tan, with the exception of a barely visible blue and teal bowtie. Oberon also wears a traditional jungle explorer hat that corresponds with his jacket. The large hat adds some additional width and height to the vinyl offering. 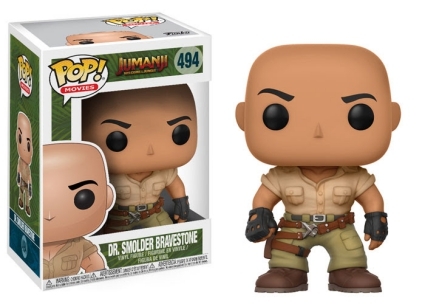 Although the Dr. Smolder Bravestone figure is unique, it is not the first for "The Rock," as he is also included in Funko Pop WWE and Funko Pop Fast & Furious.